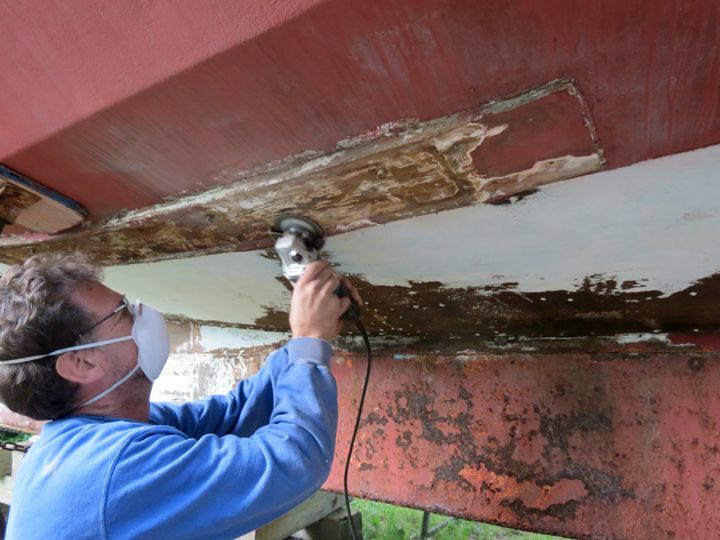 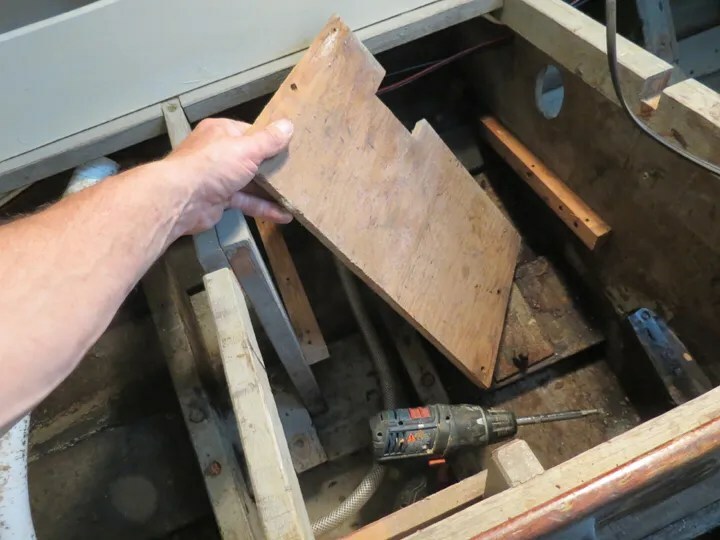 To remove the starboard Bilge Plate Shoe, I needed to do some work inside the boat. 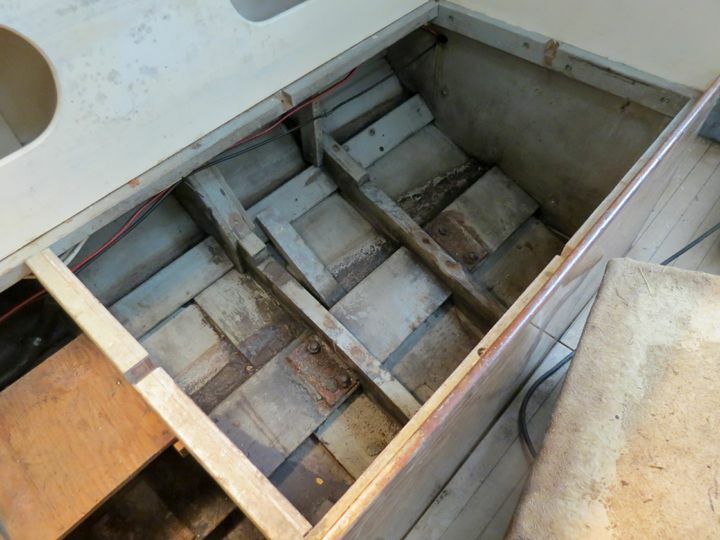 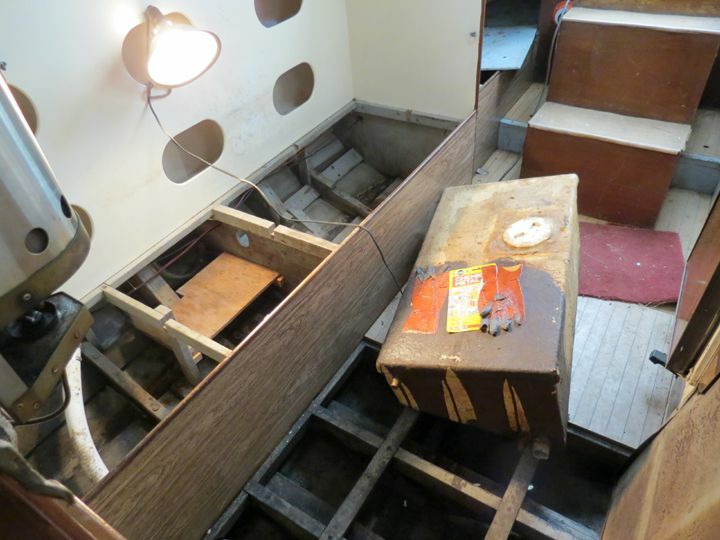 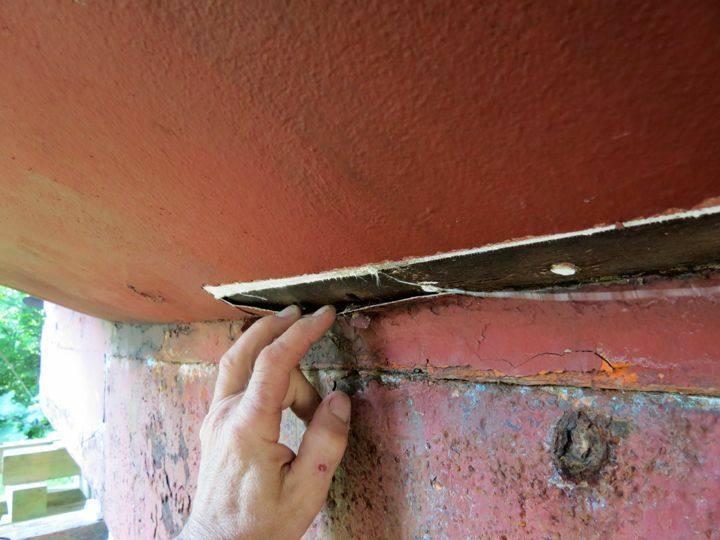 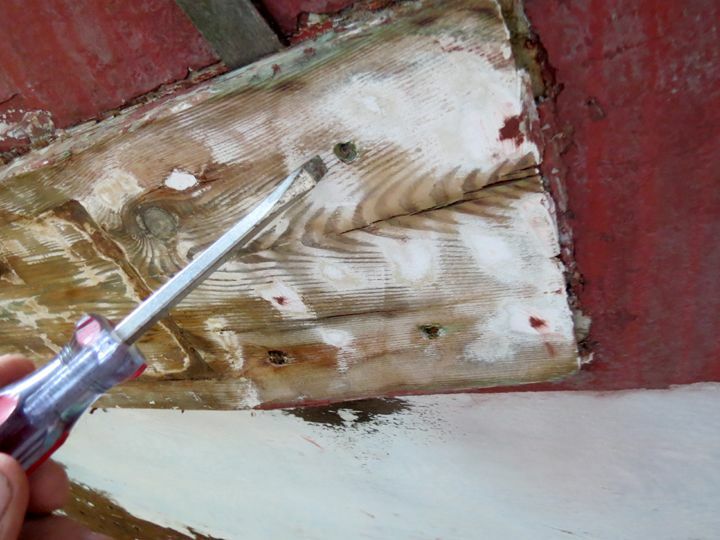 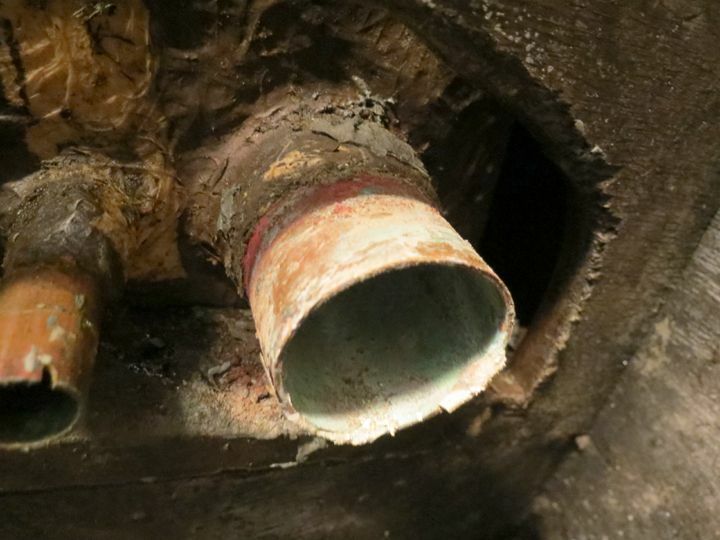 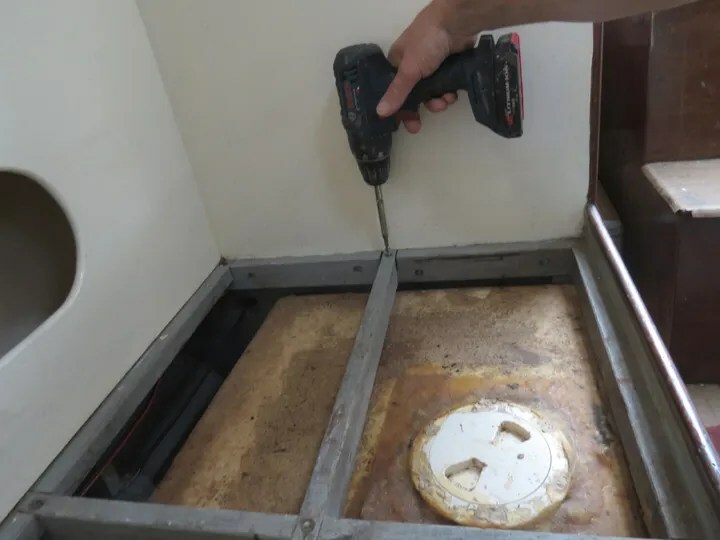 The first thing to do was to remove the starboard water tank from underneath the main salon starboard bunk. 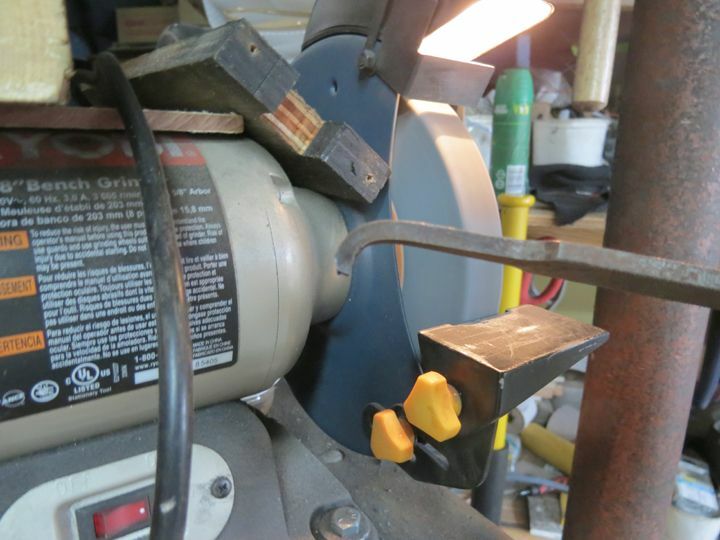 I used my battery drill, with a flat screwdriver bit loaded into the drill’s chuck. 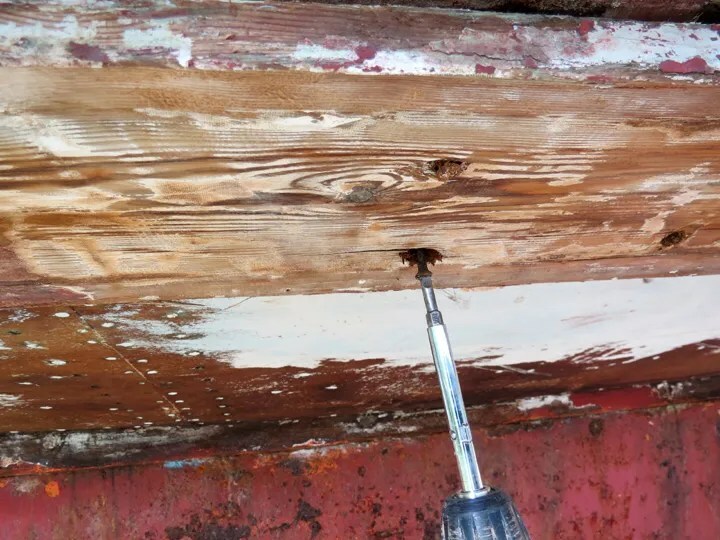 I backed out the screws that held the bunk timbers in place. 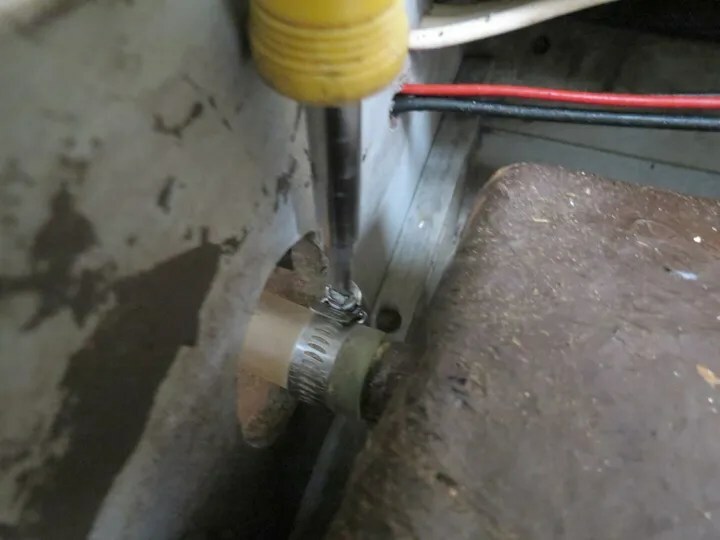 I removed the water tank’s vent tube hose. 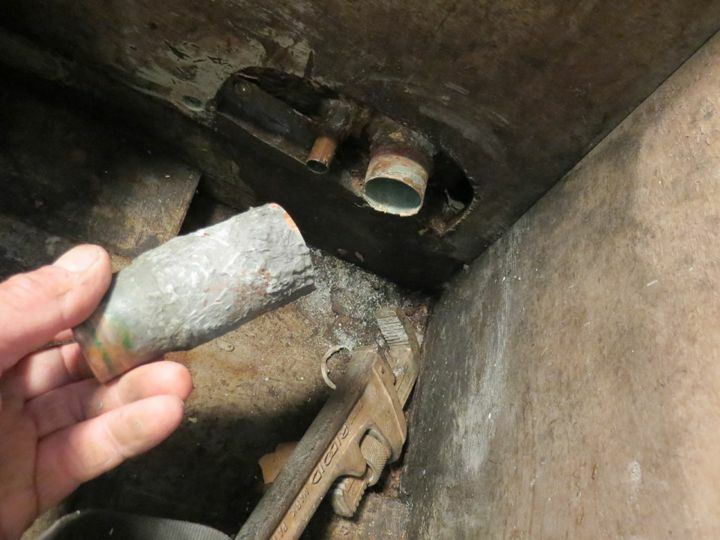 And, I removed the supply hose from the bottom of the water tank. 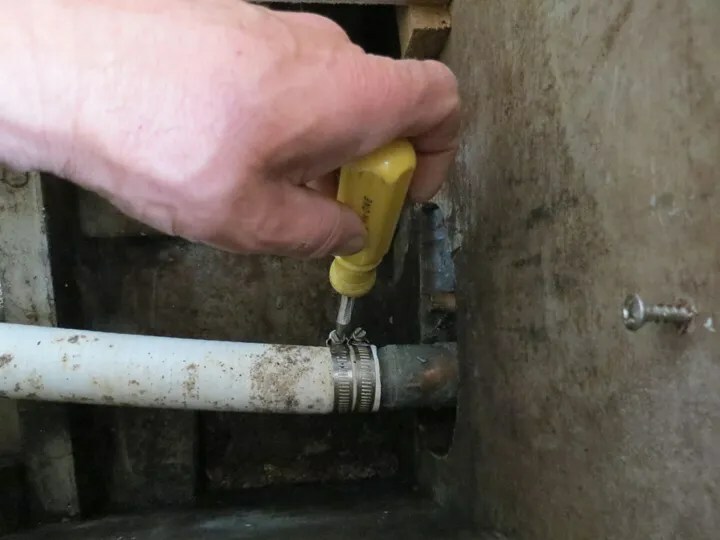 I muckled on to the adaptor with my pipe wrench and the fitting broke free very easily! 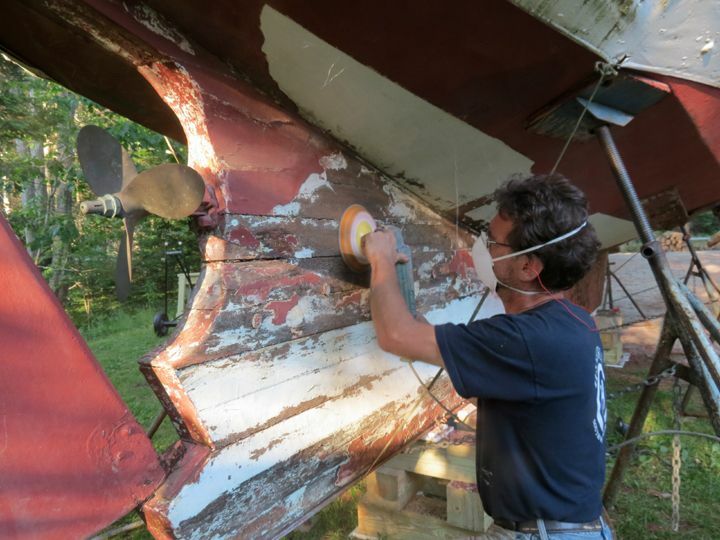 It turns out, this was two fittings fiberglassed into one. 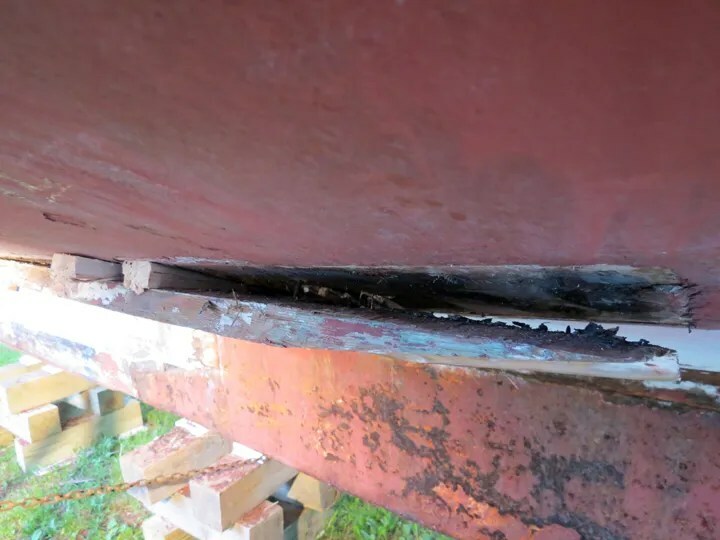 And, it leaked badly. 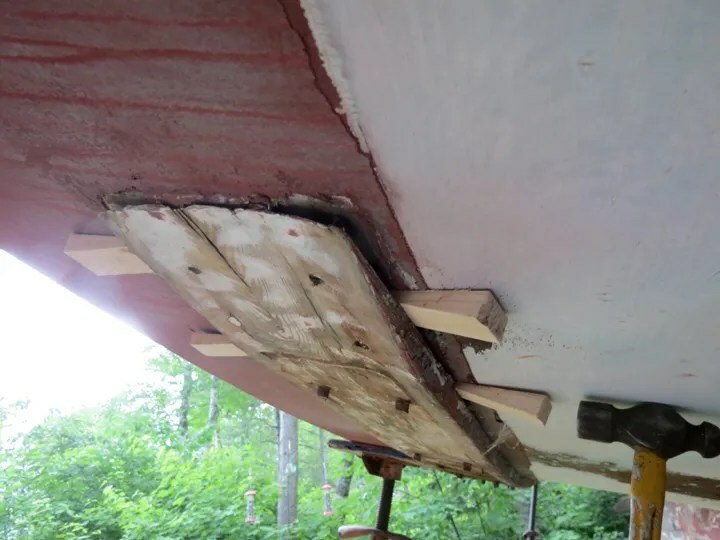 A very poor design, or some kind of repair. 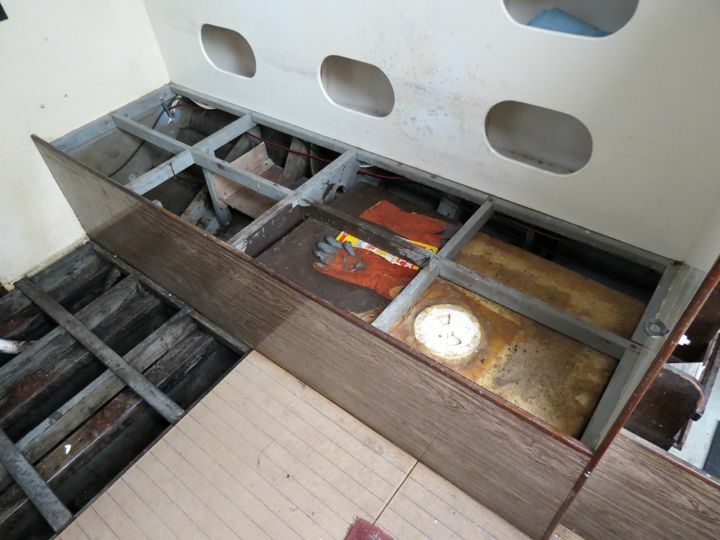 After the supply fitting was removed, the water tank could be easily lifted out of the bunk and then transferred out into the cockpit. 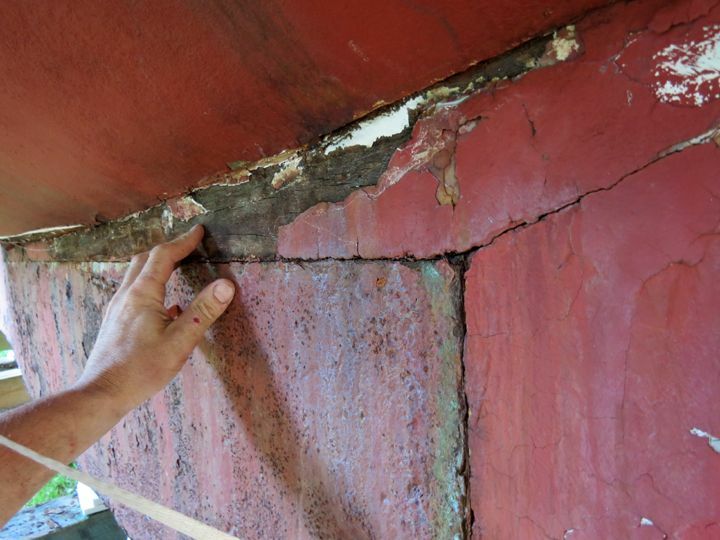 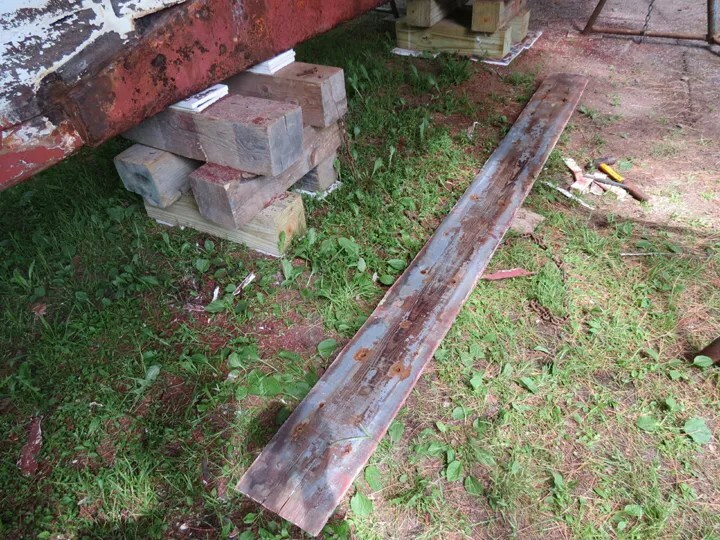 I also removed what looked like an old “house battery” platform from underneath the bunk. 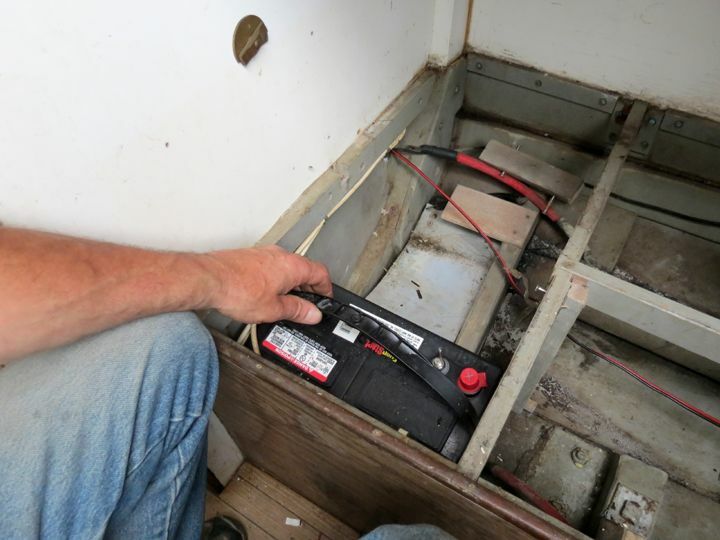 Next, I removed the Start Battery from underneath the Navigation Station. 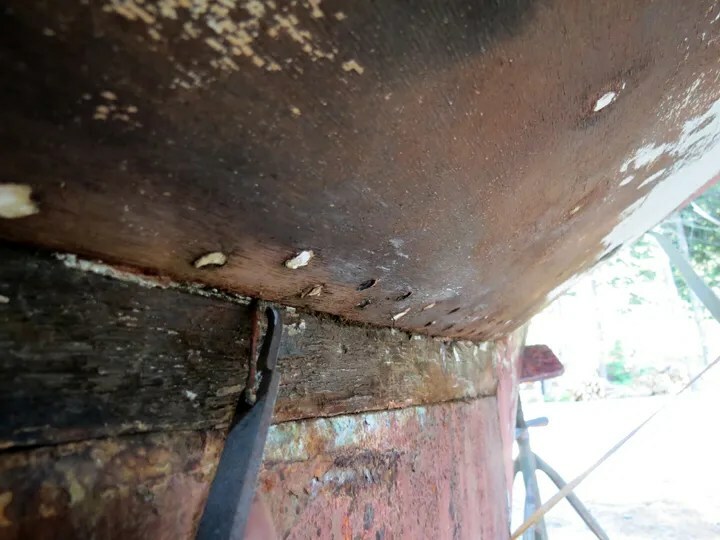 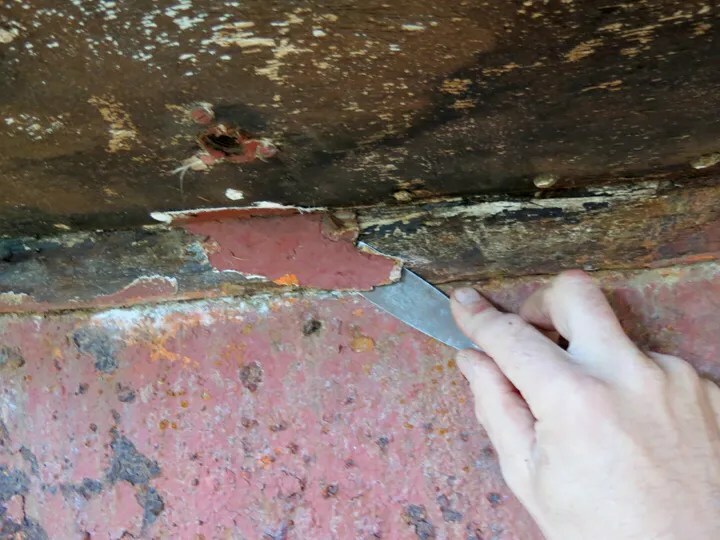 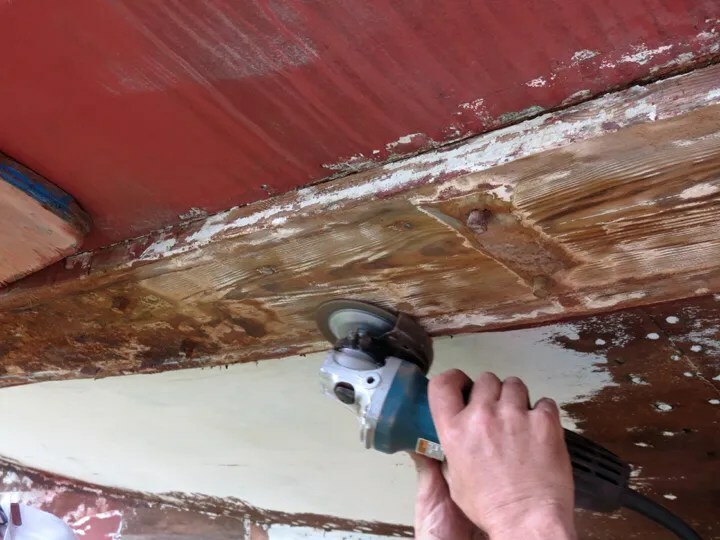 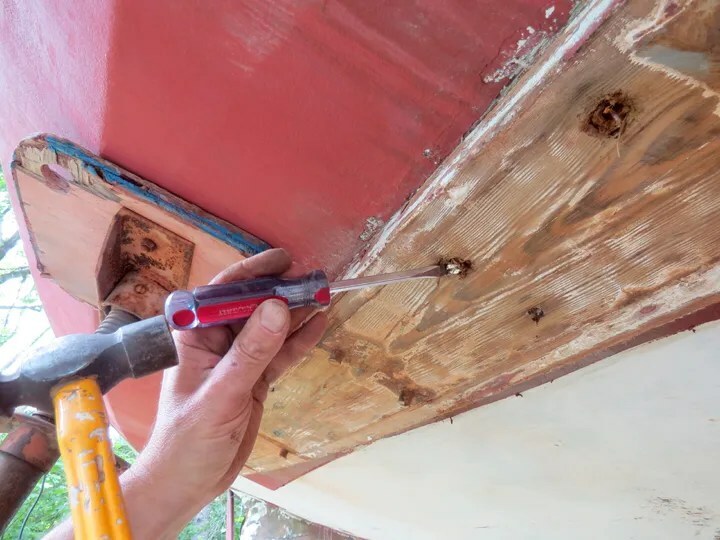 Back outside the hull, I used my Makita grinder to deeply clean off the surface of the Bilge Plate Shoe so that I could expose the heads of the fastenings that were hold the shoe to the hull. 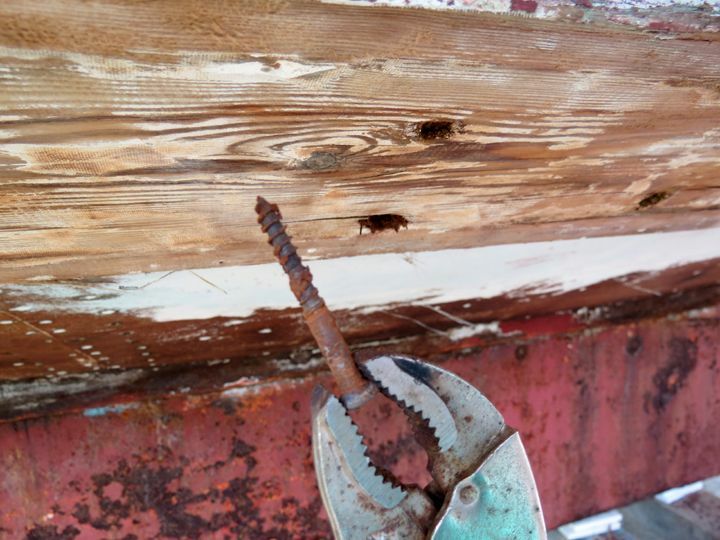 Some of the screws backed out easily. 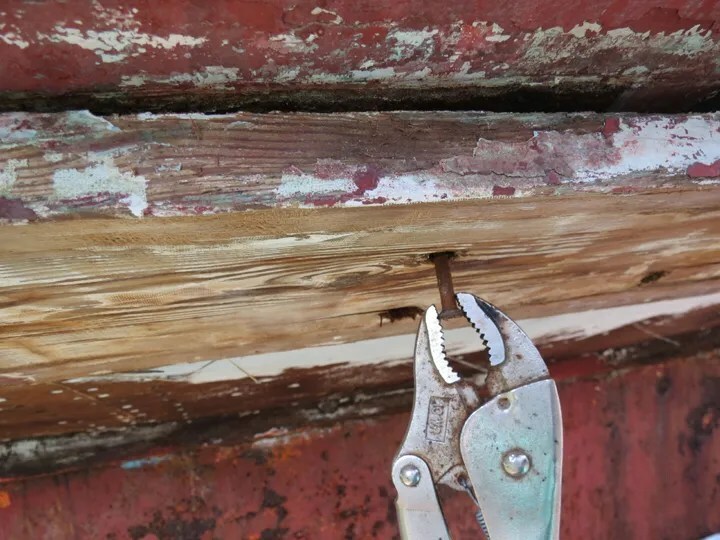 Most of them didn’t! 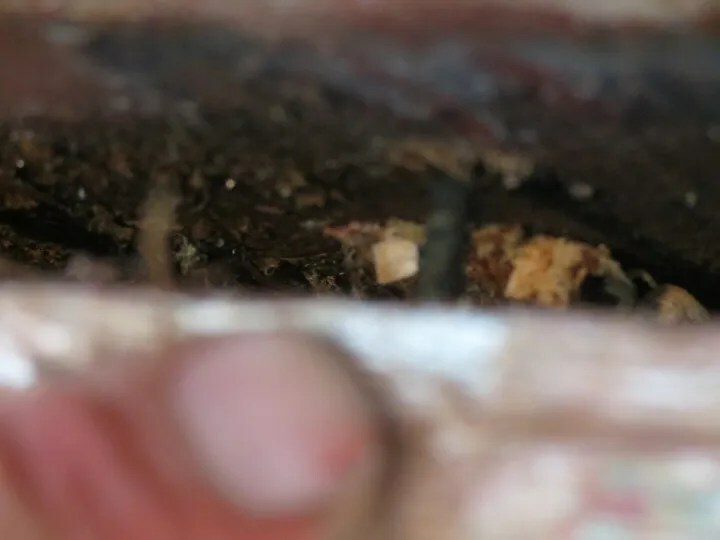 Because I plan to replace the shoe, I didn’t mind “digging” a hole around the head of each screw, using a hammer and a screwdriver to do the excavating. 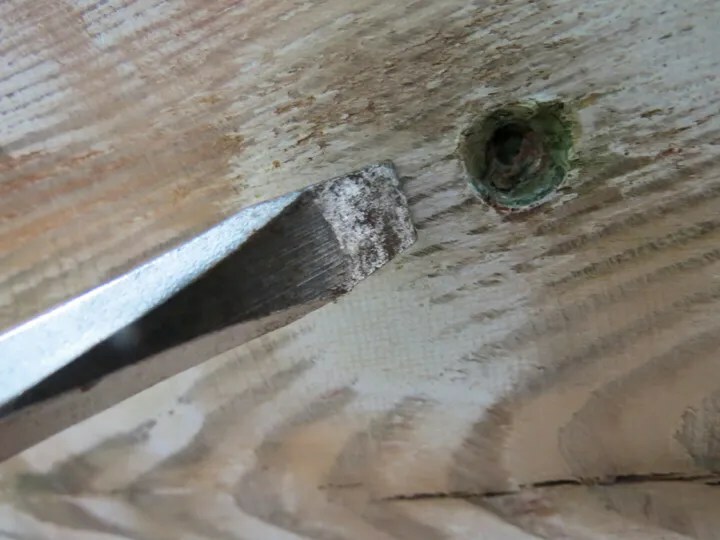 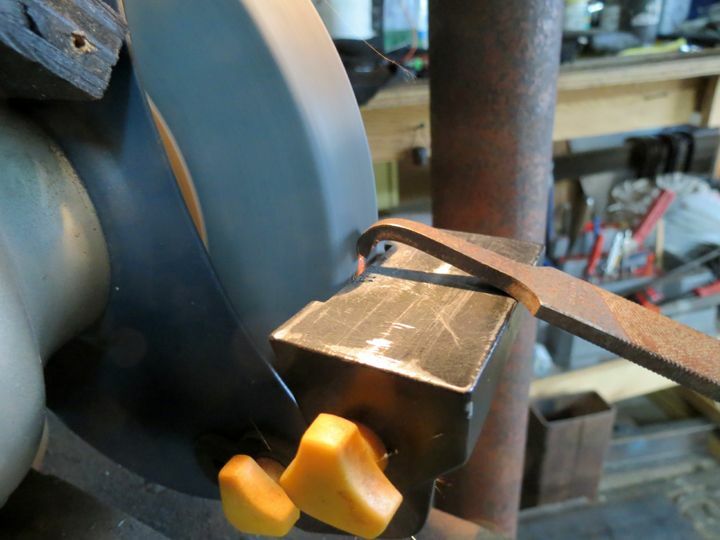 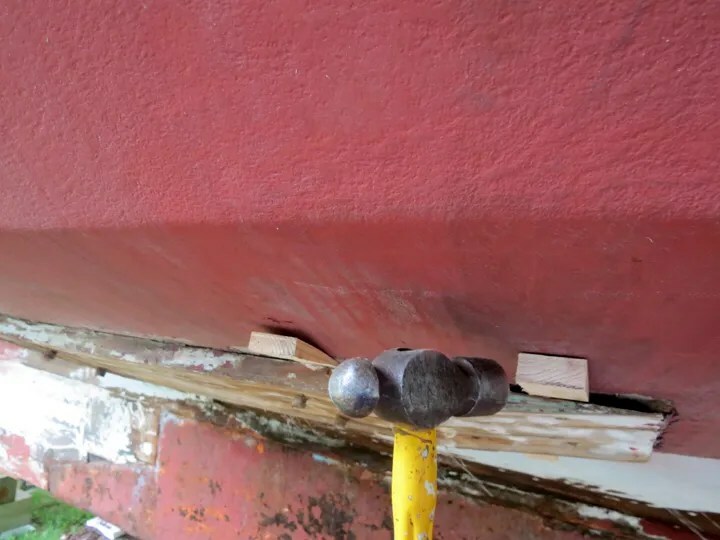 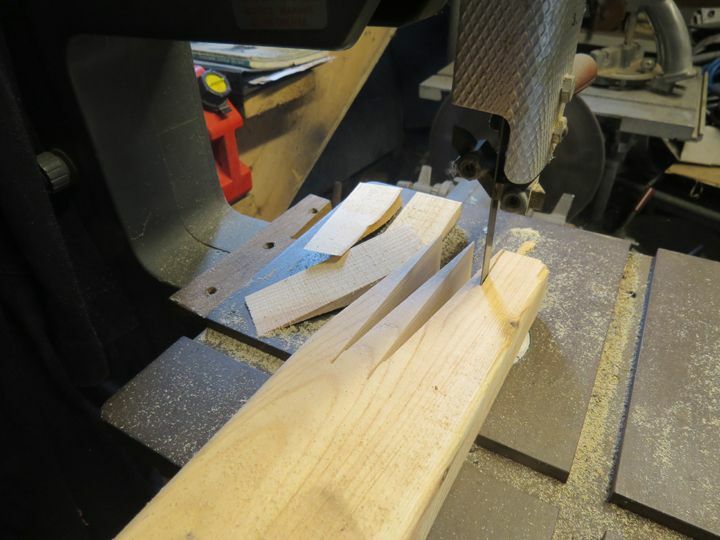 After all of the screws were removed, using the blunt end of a splitting maul, I drove the Bilge Plate Bolts up flush with the face of the shoe. Then, I drove the bolts clear through and free of the hull using a hammer and a drift. 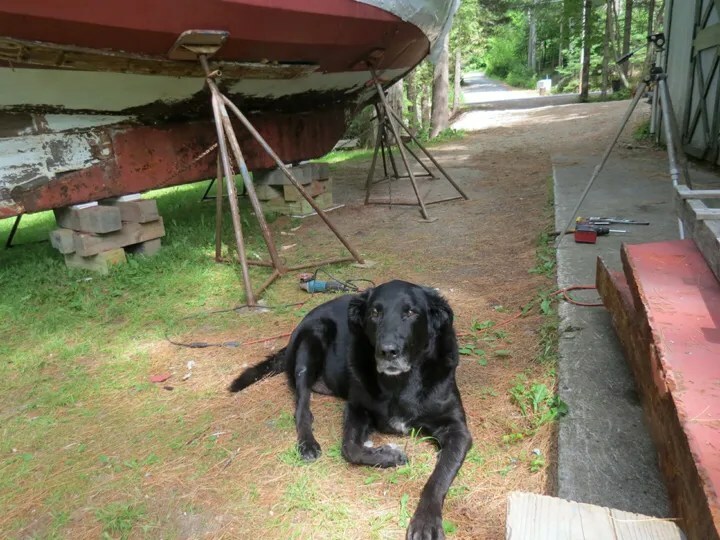 My dog Reuben supervised each step of the way! 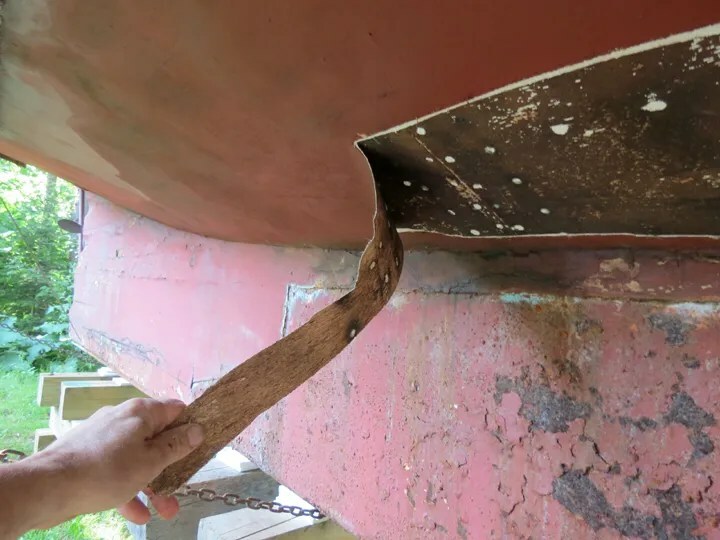 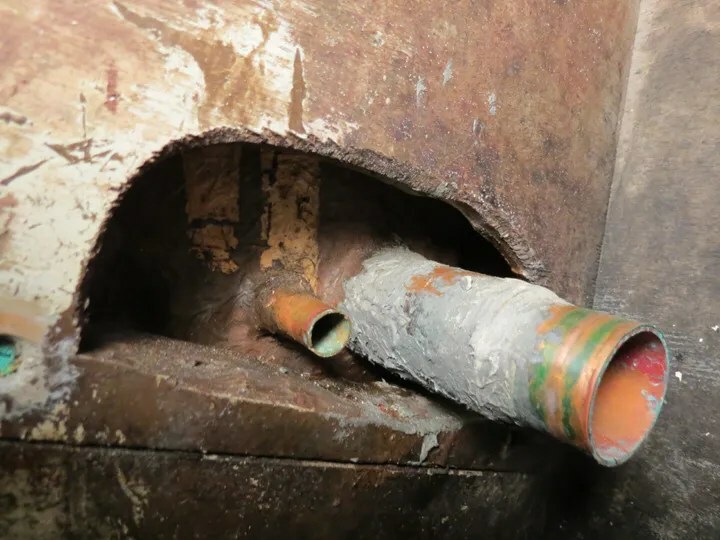 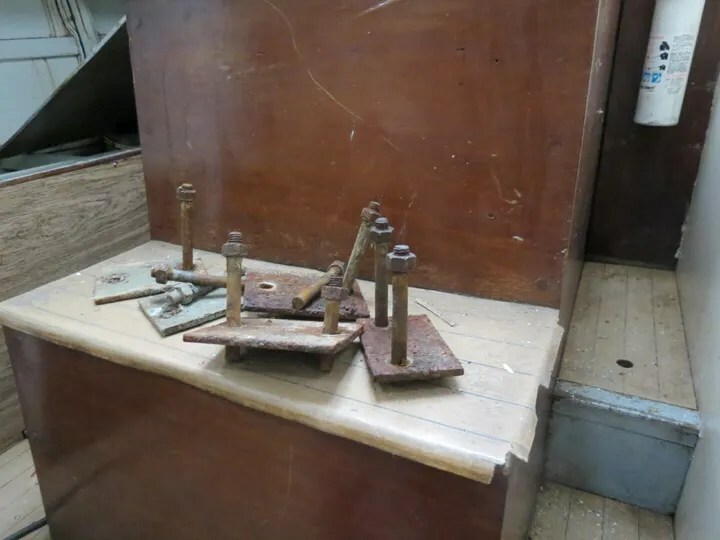 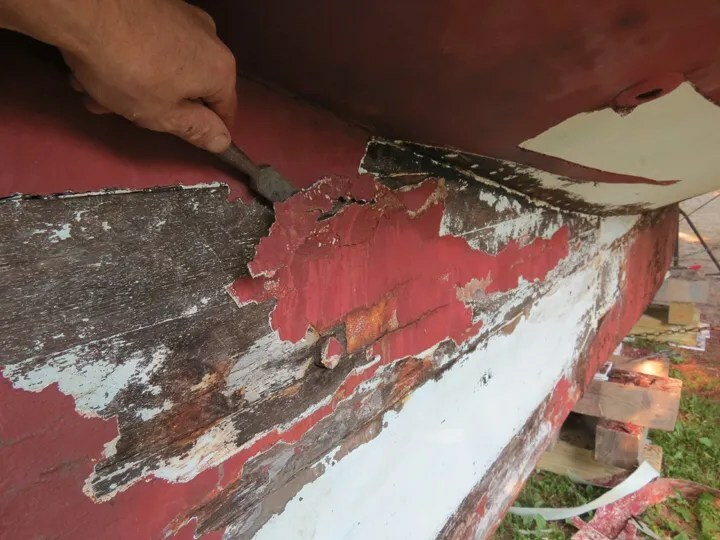 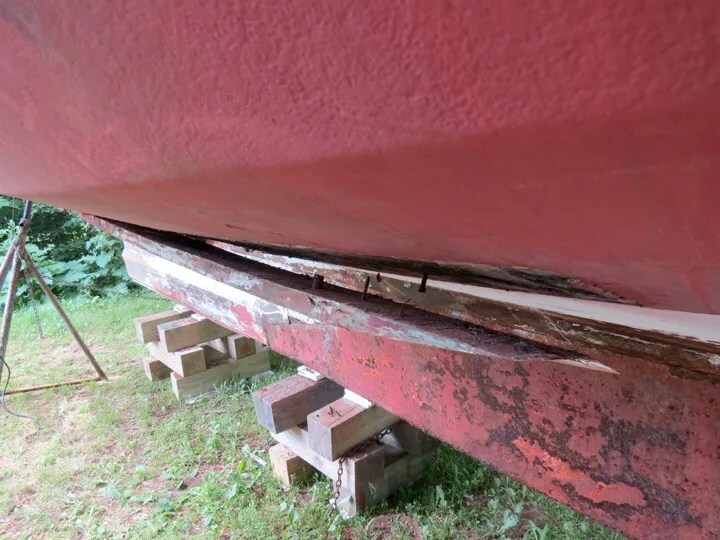 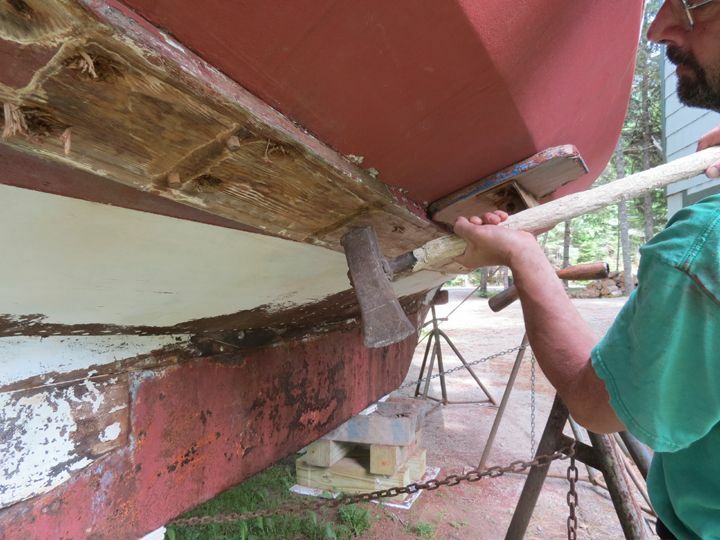 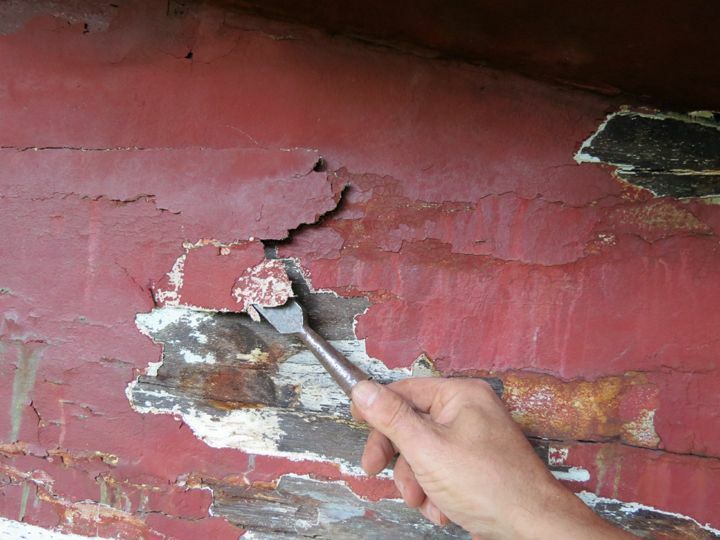 Once the Bilge Plate Bolts were clear of the hull, I returned to driving wedges between the shoe and the exterior surface of the boat. 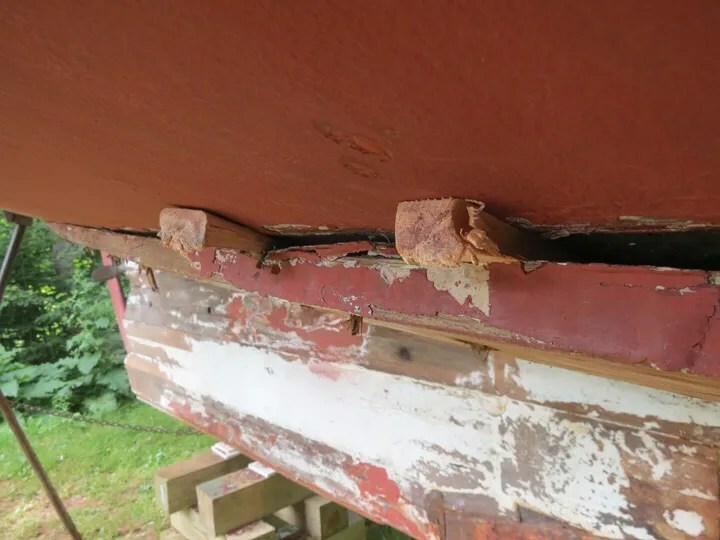 And, the Bilge Plate Shoe dropped free from the hull! 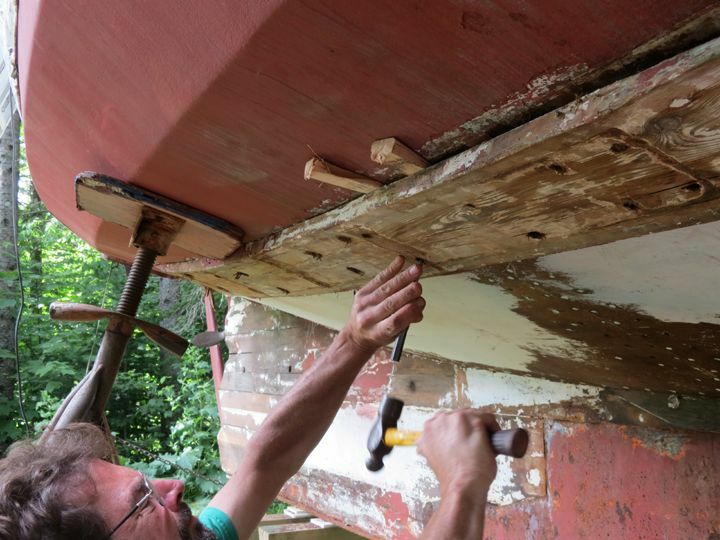 I climbed inside of the hull and gathered up the old Bilge Plate Bolts and backing plates.